Meet Krakatoa, resident of the St. Augustine Alligator Farm. He recently celebrated his 8th birthday with a party hat and a birthday cake - with a twist. 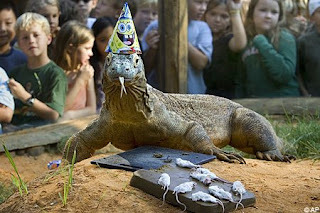 Krakatoa's cake was make from meat with an "icing" of dead mice (of which he normally eats about 10 a day).